Ao Sane Beach is a beautiful little beach located within the northern headland of Nai Harn Beach on the south west coast of Phuket. Ao Sane is somewhat of a secret beach in Phuket, which we should possibly keep to ourselves, however as we like to share our travel secrets we thought that we should let you in on it's location. There are three small beaches that make up Ao Sane, all of which are separated by small rocky outcrops. The beach itself is very small with rocks both in the water and on the beach. The sand is quiet course, not soft white sand like most other beaches on the west coast of Phuket, although the water is very clear with coral located close to the shore. The beach is not that big, it's about 200-metres long and enjoys regular return visitors during the high season as it is lined with trees that provides shade from the hot sun. Generally this is a rather quiet beach and the day we visited there was no one on else there, just us and it was absolute heaven. 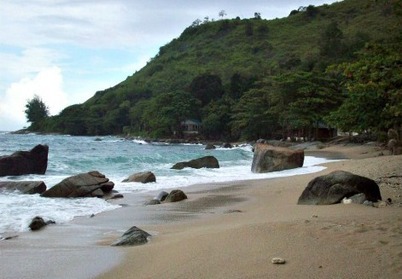 The first time we explored this beach was at the end of the monsoon season so you would expect it to be quieter. 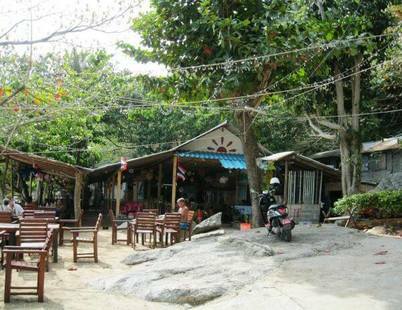 During our return visits to Ao Sane we have noticed that it has become very popular. If you are planning to go to Ao Sane through the high season expect to find other beach lovers looking for a peaceful spot away from the crowds as well. 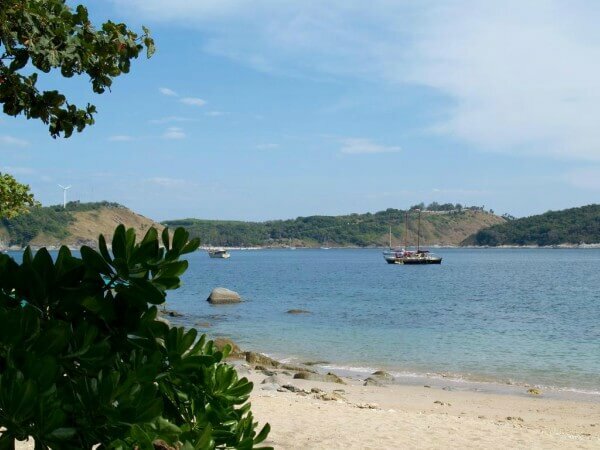 Ao Sane beach is perfect on high tide from November to March for snorkeling or scuba diving, although it is not a great swimming spot, due to the rocks that are in the water. If you are planning a day at Ao Sane, make sure to bring a towel, during our last visit to Ao Sane there were sunbeds for hire at one end of the beach and you will have to bring your own snorkeling equipment as well. Through the high season you can rent kayaks and the best news of all is there are no jet skis or really anything else to bother you. There is a restaurant on the first beach. The food is not too badly priced and the food is good. The restaurant is open from early in the morning till late at night, most importantly it has toilets and showers. Along the beachfront you will find budget priced bungalows, these bungalows were badly damaged in the tsunami and have since been rebuilt. We were quoted 1,000 baht per night for a double room with air conditioner and hot shower. 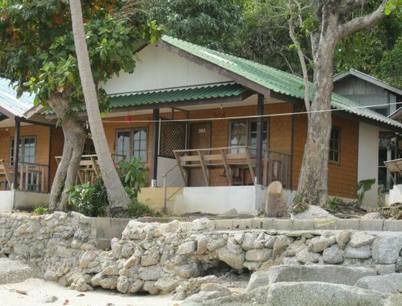 There are also cheaper bungalows for 500 Baht & 600 Baht. To stay at theses bungalows it would be best to call in advance to check the room rates and to see if there are vacancies. If the cheap bungalows at Ao Sane are not for you, there is also the 3 star Baan Krating Resort which is located overlooking the beach. Baan Krating Phuket Resort is set in a secluded location and is only a 15-minute walk from Nai Harn. The resort offers an exotic holiday destination, in a unique jungle setting overlooking the ocean. 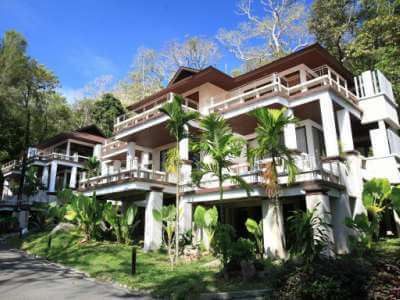 The resort has well-appointed rooms, with 65 detached and semi-detached villas located on the hillside. Facilities include a free form swimming pool with a children’s pool, a clubhouse with an internet café and lovely sea views. The Nai Harn Resort is located nearby on the beautiful Nai Harn Beach commanding gorgeous ocean views to the southern tip of the Island. 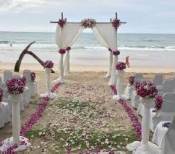 There is also a good range of resorts and hotels available at Nai Harn. 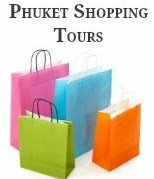 The area around Ao Sane and Nai Harn is a fantastic destination for a romantic getaway or a peaceful family holiday vacation in Phuket. 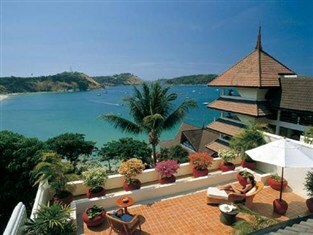 From Nai Harn you will have to drive through the Nai Harn Resort and follow the cliff side road for about 1 kilometre. There is a small parking area above the beach just beware of the rocks around the parking area.